ADD A TOUCH OF RUSTIC CHARM to your home with our Americana Dabbling Mallard Duck Decoys. Sold as a set of 2, each set includes a tawny brown hen and an iridescent green-headed drake FOR INDOOR AND OUTDOOR DISPLAYS Designed to be displayed indoor or as floating decoration in ponds or pools, these adorable ducks measure as follows: 8 5/8 x 4 3/4 x 4 3/4 Inches. BEAUTIFULLY MADE Inspired by antique wooden hand carved decoys long used by American hunters to attract wild birds, our decorative Mallard Ducks, Drake and Hen Set of 2, are made of high quality cast polyresin. GORGEOUS COLORS Painted with fine details such as white rimmed feathers on the hen, and the distinct iridescent green head of the drake, together both bring beautiful colors with shades of green, blue and browns, to any place where they are placed. The pair fit into outdoor garden environments as well as a wide variety of décor themes inside the house. FULL OF RUSTIC APPEAL, this pair of handsome ducks are ideal for gifting and perfect presents for celebrating special occasions and holidays. Enjoy! By Whole House Worlds Welcome to the product line of Whole House Worlds. The New York based company offers high quality, stylish products for every room in the house, and beyond. From the kitchen, to the living room, to the bedroom, dining room, home office, closet and garden: Our criteria are comfort, quality, style and value. FOR INDOOR AND OUTDOOR DISPLAYS Designed to be displayed indoor or as floating decoration in ponds or pools, these adorable ducks measure as follows: 8 5/8 x 4 3/4 x 4 3/4 Inches. 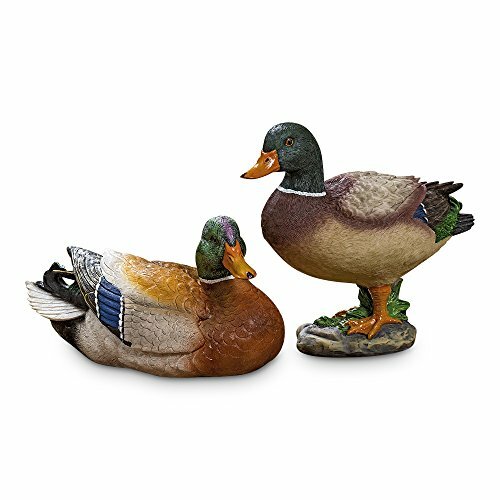 BEAUTIFULLY MADE Inspired by antique wooden hand carved decoys long used by American hunters to attract wild birds, our decorative Mallard Ducks, Drake and Hen Set of 2, are made of high quality cast polyresin. GORGEOUS COLORS Painted with fine details such as white rimmed feathers on the hen, and the distinct iridescent green head of the drake, together both bring beautiful colors with shades of green, blue and browns, to any place where they are placed. The pair fit into outdoor garden environments as well as a wide variety of décor themes inside the house.